Kuyu (Kuyu) also known as (Givi) is a city in Kowsar County, Ardabil Province, Iran. Kuyu borders Ardabil to the north, Khalkhal to the south, Hashtpar in Gilan Province to the east, and Mianeh to the west in East Azerbaijan Province. 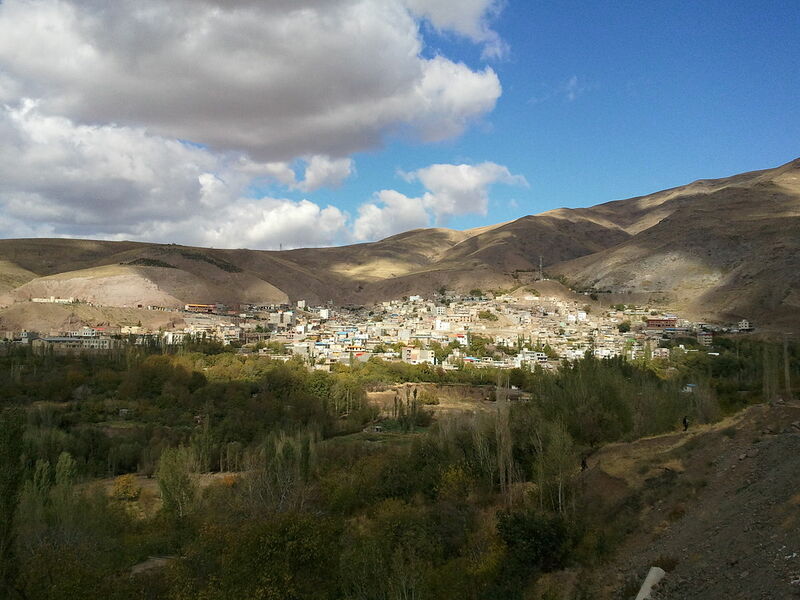 Kuyu constitutes 7 percent of the area of the Ardabil province. Bajilar Daghlari (which means The Sisters Mountains in Azeri Turkic) extend between Kuyu and Miyaneh. Kuyu is in a mountainous region, with temperate mountainous climate on the western side of the Baghru (Talesh) Mountains. The average annual precipitation of the region exceeds 350 millimetres (14 in). Arpa-Chay, Givi-Chay, Sangava (Sangour) Chay are the important rivers of the town which join to Qiziluzan river in the borders of Mianeh. Kuyu has much natural scenery, green mountains, and beautiful parks; for tourists attractive points of the city include Isti Sou (Warm Water) spa, the peaceful and soft mountainous climate of the region and medical effects of spas, which attract many tourists during summer every year, especially from Tehran. Natural scenery of the city includes: Roustam dashi (Rostam’s Stone), Dash Hamam, Zinjirovpir, Bouzlouq (glacier), Havashanaq Village, Sarmistan or Salmistan, Mashgoul, Mashgul Manbari, Firouzabad bridge, and earth dams such as Qara-Qishlaq. The spas of the city have several local and overall biologic effects on the body. Cutaneous effects include improving skin tissues and its general effects include recovering body metabolism. Spas are a type of natural resource. The most important spa in the city is Isti Sou (Warm water) or Kuyu-Soyu, which is located five kilometers from Kuyu-Khalkhal (Hiroabad) Road. Of the other known spas in the city is Dash-Hamam (Stone Bath) Spa, which is located in the northeast of the city, among gardens. The spa is located five kilometers from Kuyu, on the way of Ardabil-Khalkhal road, on a mountain. Water temperature measures 45 °C (113 °F). Local people believe that cutaneous and particular disease such as rheumatism and articular pain can be treated by swimming in the spa. Thus, loading and unloading of the spa may last for some hours. The temperature is so high that one cannot enter in it gradually therefore it is better to enter in the spa suddenly. This bath is located east of Kuyu, among gardens, beside Kuyu Chay River, close to Dalikli Dash (The Pored Stone) and inside in a carved rock. Men can use the bath on Friday and nights, and women during the rest of the week. After incumbency of municipality by the mayor, Mokhtar Jamili, the program changed, and men can use the bath in Fridays and Mondays and women during the rest of week. The water of the bath is supplied from two hot and cold-water spa is useful for removing kidney stone. Some of the inhabitants take the water to their homes and brew tea from the water of spa. Unlike other spas, after which one may feel thirsty, after this bath people are more likely to feel hungry. Zinjirovpir is one example of the beautiful natural scenery of Kuyu, which is located in the southeast, and east of the city on the mountain. The appellation refers to the legend of a devout girl who was tortured by the gangs and requested God to help her disappear so she would be safe. Due to her moral tradition, God admitted her request and she vanished. Because the girl was not engaged, she died unmarried. Since then, on April 2, in spring, and early autumn, women provide some votive foods and celebrate the wedding of the girl while appreciating her. Ganjah Goli (Gəncah Gölü, which means The Ganjah Swamp in Azeri Turkic) is located 16 kilometers far from Kuyu, northwest of Ganjah village, which is one of the attractive areas for tourists. The bridge is in the Firouz district at the entrance of Firzabat village (center of district). It was built in 1933 during the incumbency of Rezakhan of the Pahlavi dynasty, by German architects. The stone is located at northeast of Kuyu, up Kuyu-Khalkhal road, on the Aznov (Aznav) mountain. People tell a story that it was grit in Roustam’s shoe or Roustam carried it by himself. Sarmistan is believed to be an example of the natural and tourist-attractive scenery of Kuyu, and many colorful and fragrant flowers are found there. The water of the region is very cold and is located northeast of the town, up spa, close to Goy Yal (Cottage of Rahim Soyoudi). The stone is located northeast of the city, under Kuyu-Khalkhal road, among gardens. In this place, unmarried girls and infertile women gather together and pray to get their wishes and pass through the hole on the last Wednesday of Iranian Calendar, and if their wishes are fulfilled, they will celebrate their accomplishment in the same location and time and offer people cookies.